I can’t speak for you but let’s get this out of the way right now once and for all! 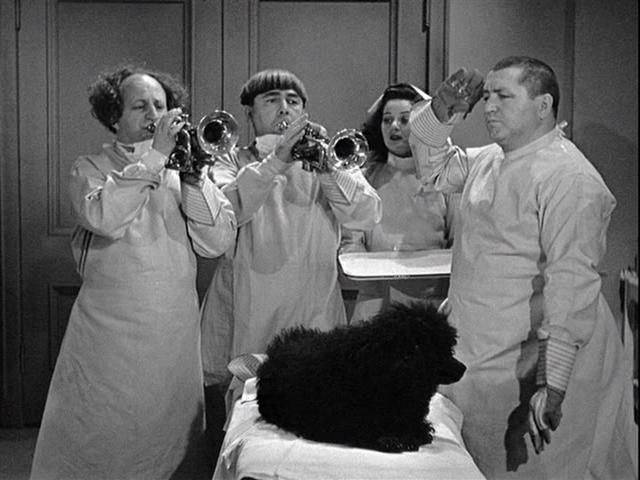 I just love The Three Stooges. 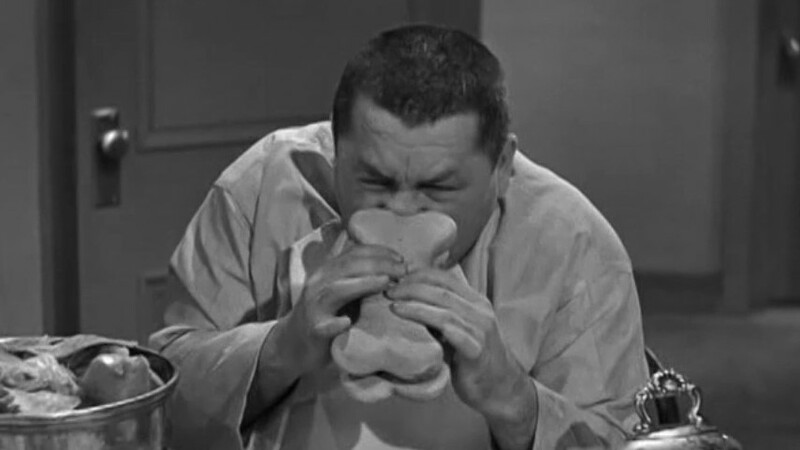 Watched them as a kid, imitated their crazy antics and facial gestures and adore Shemp just as much as I do Curly. Catch me in the right frame of mind and you’ll still spot me imitating their idiotic moves and quoting one liners (“Say a few syllables kid”) to this day as a full grown adult who still thinks he’s a little kid at heart. Again I can’t speak for you but would like to think I’m not alone in my daydreams as a wanna be Moe Howard. Now on to Brando the movie watching Dachshund’s selections. 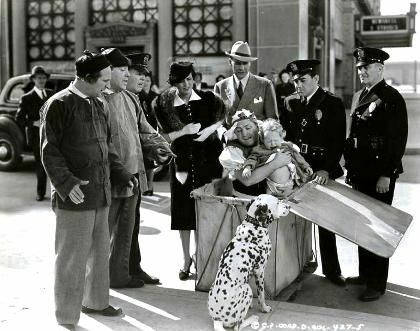 When a well to do family is planning on a trip to Palm Springs, the couple played by Bess Flowers and Lane Chandler think it best to send their pet Dalmatian to the K-9 Dog Laundry for a bath, shampoo and pedicure. 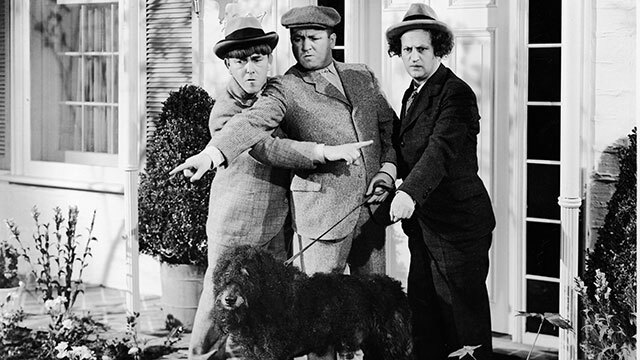 Enter our three heroes Curly, Larry and Moe. With Moe at the controls where we’d expect to find him, a conveyor belt that runs like an automated car wash begins taking the dog through a series of water falls and scrub downs capped by Larry removing a flea and Curly polishing the pooch’s nails. Now it’s time to throw that curve ball at the boys that inevitably leads them into trouble. Miss Flowers has no intention of taking the dog to Palm Springs and heads off without her hubby. 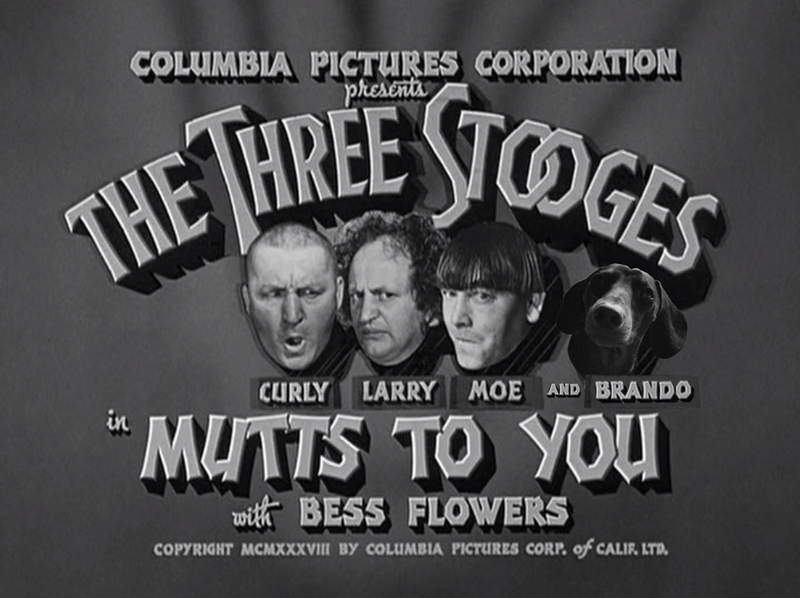 Meanwhile Lane picks up the dog and this leaves the Stooges to take a break from the office in their old jalopy that Curly will of course be pushing while Moe and Larry man the wheel. Toss in a slap and a “Hey, Porcupine!” In screwball fashion they happen upon the home of Flowers and Chandler at the exact moment she sets her small baby down on the front porch and goes to see if the rear door is open after locking herself out. Looks like an abandoned baby to me and the Stooges agree. “I like babies. I was one myself once.” As usual the boys mean well and take the child back to their rooming house where they’ll have to sneak him past long time collaborator, Vernon Dent, who suspects the trio are up to no good. Within hours the baby’s on the front page of the paper. KIDNAPPED! 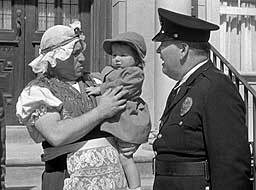 Still to come is a madcap chase scene with plenty of slapstick and Curly donning a dress for maximum effect as they flee from another familiar face to Stooge fans, Bud Jamison, as a Irish cop on his beat. We know the boys will win out in this 18 minute short from director Charley Chase but it’s the slapstick and crazy goings on that make it so enjoyable to turn the clock back and see some harmless on screen fun. 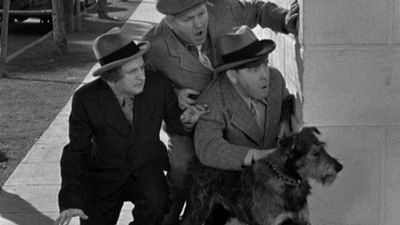 Chase directed a handful of Stooge shorts before passing in 1940. Would you believe Bess Flowers who scored title card billing below the Stooges has an incredible 912 credits to her name over at the IMDB!!! And even Lane Chandler has an astounding 393. In this four legged adventure directed by Jules White, the Stooges own and operate a dog hospital/retreat. It’s a big time surgery that begins this hilarious short that sees the boys dressed in doctor’s gowns to remove a thorn from the paw of their patient. Once removed don’t be surprised if that pointy thorn finds it’s way to Curly’s rear end. The boys main patient is Garcon, a large black poodle owned be a wealthy socialite. They’ve been charged with a complete grooming of the dog. While he’s in their care, a pair of dognappers posing as newshounds turn up to get a tour of the dog retreat. The trio go over some of their more serious cases. These include a St. Bernard who thinks he’s a lap dog. “He just lapped up two cases of beer.” Or how about another poor mongrel who is known as a GCM. That’s short for a garbage can moocher. When the call comes over the airwaves paging the boys they’re off and running through the halls leaving poor Garcon in the hands of the crooks. A ransom note sends the boys into a panic. First up is to find a doppelganger to return to the dog’s owner leading to plenty of hairpulling. Meaning Larry is about to lose some more of that wiry mop atop his head while they glue some bed stuffing to the intended imposter. When the ruse doesn’t work out so well they’re given an ultimatum to bring back the dog or face legal consequences. That puts them on the trail using their four legged mutt to hunt down the dognappers and bring Garcon home to Mommy. This will result in one of those classic fist fights where the boys tangle with the crooks and barely a man or stooge is left standing compliments of the arm in the sleeve rotating punch maneuver. Stooge fans will know what I mean. The rest of you will just have to check it out. 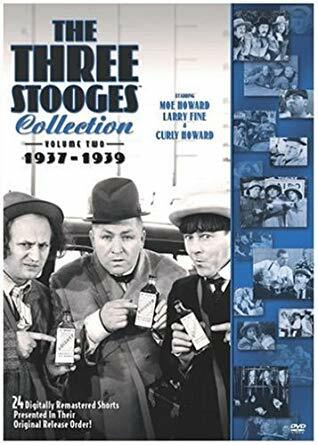 Starting with Three Missing Links in 1938, director White would find himself behind the camera on Stooge shorts through the Shemp Howard years and even the few that featured Joe Besser alongside Moe and Larry as the 1950’s came to a close. 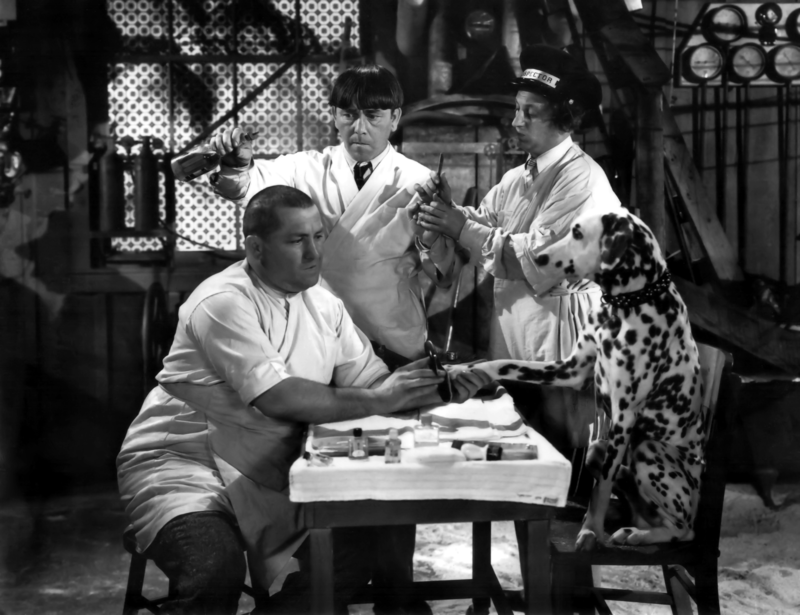 Calling all Curs along with Mutts To You represents the comedy icons in fine form offering up their slapstick specialties that still has me in stitches years after being introduced to them by Mom and Dad. Good father that I am, glad number 1 and number 2 sons here at home laugh right along with me. Both of these comical shorts can be found in the volume 2 set available from Columbia that covers their extensive and entire catalog. Now that I’ve introduced Brando to the Stooges, he can’t stop smacking me with his tail in the kisser and attempting to gnaw my nose. All in good fun I’m sure. Anyone who doesn’t like the Stooges is obviously a Knucklehead!! Those are the syllables I’m looking to here kid. A and C Meet Frankenstein the best horror spook for my money of them all. Know it like the back of my hand. Blondie series is fun and offers a chance to see many up and comers in training at the studio like Glenn Ford etc.